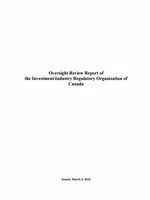 MEMOFIN - Oversight Review Report of the Investment Industry Regulatory Organization of Canada - L'information financière que vous ne trouvez nulle part ailleurs ! The Investment Industry Regulatory Organization of Canada (IIROC) is the national selfregulatory organization (SRO) that oversees all investment dealers, as well as trading activity on debt and equity marketplaces in Canada. IIROC is recognized as an SRO by the Alberta Securities Commission (ASC), the Autorité des marchés financiers (AMF), the British Columbia Securities Commission (BCSC), the Financial and Consumer Affairs Authority of Saskatchewan (FCAA), the Financial and Consumer Services Commission of New Brunswick (FCNB), the Manitoba Securities Commission (MSC), the Nova Scotia Securities Commission (NSSC), the Office of the Superintendent of Securities, Service Newfoundland and Labrador, the Ontario Securities Commission (OSC), and the Prince Edward Island Office of the Superintendent of Securities Office, collectively, the Recognizing Regulators (RRs). IIROC’s head office is in Toronto with regional offices in Montreal, Calgary and Vancouver. This oversight review was conducted jointly by RR staff (Staff) of the ASC, AMF, BCSC, FCAA, FCNB, MSC, NSSC, and OSC. This report details the objectives, methodology, frame of reference, report format, scope, overall assessment, and findings of the review for the period from January 1, 2014 to March 31, 2015 (the review period).